Has HTC just won the rights to make an awesome Google tablet? It's been over two years since the Flyer. Is HTC really coming back to tablets? HTC might be bringing a new tablet to market in the third quarter of the year, but if you're hoping for a Sense-laden slate you're out of luck, as according to rumours HTC is partnering with Google to manufacture a new Nexus device for release during that time frame. The rumours, which come from Taiwanese media, state that HTC won orders to manufacture a 'high-end' Nexus tablet model. Unfortunately the report doesn't specify what size the tablet will be, but we'd expect it to be either a 7- or 10-inch option. If HTC makes the tablet, it's likely it will replicate some of the design into its own model as well - although whether it can make a go of the slate market remains to be seen given the tepid reaction to the HTC Flyer a few years ago. Arguably all of the Nexus devices are high-end, so as we said this rumoured device will be a refreshed Nexus 7 or a Nexus 10, with the larger of the two the more expensive and better specified device. Google's 10 inch tablet has gone AWOL since the first model was released in 2012, so it's due a refresh - but if HTC has just won the contract now, then it's unlikely to making the Nexus 10 sequel. Another possibility is that it could be a size we've not seen before from the Nexus range. We've heard rumours of a Nexus 8 coming out this year, so perhaps HTC will be behind that. Or maybe the Taiwanese firm will go big with a 12 inch slate. Of course we don't know that the rumours are true, but it's about time HTC took another stab at tablets. 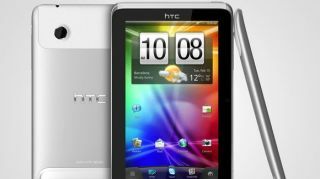 The HTC Flyer was a decent slate but it was crippled by its price tag, while the US-only HTC Jetstream had similar problems, but with Nexus devices known for their low prices an HTC Nexus slate could put the company back on the tablet map. HTC might have taken a break from tablets but it's still making great phones like the HTC One.